A decade ago, when China began developing its electric-vehicle market, it started with vehicles for public services—buses, taxi, sanitation trucks (link in Chinese)—often purchased for city fleets with government money. Now the government’s trying to play a slightly less obtrusive role in the EV industry. A growing share of passenger cars in EV sales shows that’s starting to happen. Data out this week (link in Chinese) from the China Passenger Car Association (CPCA) showed that sales of passenger electric cars reached around 250,000, more than double than in the same period last year. In the first quarter of 2019, they accounted for 92% of all EV sales. That’s sharply up from 2015, when electric passenger car sales made up a little over 50% of total EV sales, or even last year when they accounted for 80% of them, according to data from the CPCA and China Association of Automobile Manufacturers, which are both government-affiliated. The figures include battery electric and plug-in hybrids, which China calls new energy vehicles. The rise of passenger car sales comes at a time when China wants the industry to rely more on market forces than the government. National subsidies, along with other support like government procurement, and tax exemptions and credits, could have reached as much as 400 billion yuan ($60 billion) (pdf, p.16) from 2009 to 2017, according to one estimate. China began scaling back subsidies this year and will eventually take away all subsidies by 2020. While government entities or firms are certainly among the customers for passengers cars, the shrinking share of higher-priced commercial vehicles means that, as Chinese auto blog Gasgoo noted, the role of individual buyers (link in Chinese) is more prominent. The EV industry is a bright spot in China’s car market, which recorded a sales decline for the first time since 1990 last year. Sales of total passenger cars in the first quarter dropped 10.5% to around five million units compared to a year ago, CPCA data showed (link in Chinese). 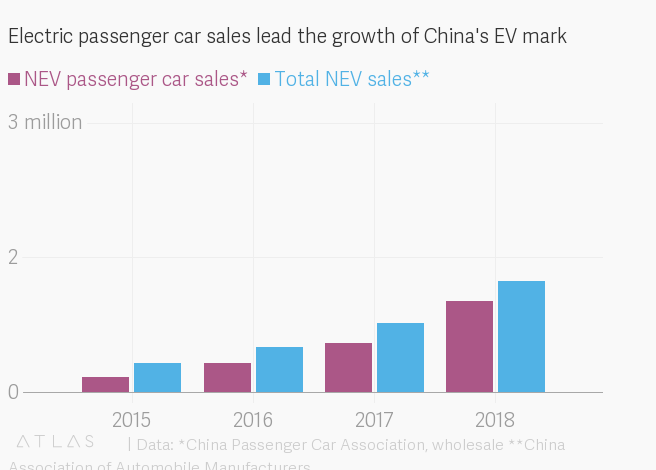 Still, EV makers have a long way to go—China sold around 1.2 million (link in Chinese) electric passenger cars in 2018, or only 4% (link in Chinese) of the total passenger car sales in the same period. This year EV sales are supposed to reach 1.7 million, according to the CPCA, about a 36% increase compared to last year’s sales, while overall car sales remain flat. The competition is getting fierce. Nonetheless, some of the biggest firms that have benefited from government subsidies until now will continue to lead. BYD, China’s largest EV maker (paywall) and a major recipient of subsidies, sold around 71,000 electric passenger cars in the first three months of 2019, or nearly a third of the total electric passenger cars sold in the period. In addition, restrictions on manufacturing mean that many EV newcomers have to partner with state-run firms to get their cars made, meaning the government’s role may be lighter, but is far from laissez-faire. Around 80 electric passenger car makers (paywall) are competing for the rest of the market as subsidies go away. Many EV sellers will likely absorb the costs of the subsidies, despite the risks to their profits, in order to maintain sales in coming months, said rating agency Fitch Ratings in a report on Monday (April 8). Update: The story was updated on April 12 with the latest sales figures from CAAM.